Find the tools you need to memorize Scripture effectively. Memorizing Scripture is hard. But it's even harder without a plan! With our memory books and journals, you'll find it much easier to stay on track as you hide God's Word in your heart. Each book divides your verses into weekly lessons, so you'll always know what verses are up next. If you'd like to memorize a collection of verses on a particular topic, use our memory book finder to pick out one that suits your interests. If you'd like to memorize a whole passage like 2 Timothy or Sermon on the Mount, consider one of our memory journals. 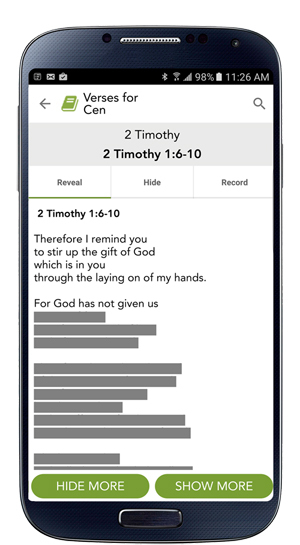 Scripture Memory Fellowship offers two apps to help you memorize Scripture: the SMF App and VerseLocker. Both are packed with helpful features designed to streamline the process of hiding God's Word in your heart. And the best part? They're both completely free! You remember things better when you hear them—especially when they’re set to music! We offer audio versions of select children’s and adult Scripture memory books, sung with instrumental accompaniment. It’s an excellent way to absorb and memorize the Word of God. Scripture Memory Fellowship offers rewards to encourage memorizers along the way. (Learn more about why we use incentives). Our inventory includes more than 100 Scripture-saturated books and more, made available at no cost to you (just pay S&H) through the generosity of donors. In addition, those who complete a memory book are eligible to attend SMF summer camp. If you have questions or would like resources to share Scripture memory with others, just give us a call. We would be happy to provide resources like bulletin inserts or other promotional materials for your church, Sunday school class, or homeschool support group. Special speakers for churches or groups can also be arranged.